This evening I was inspired to complete some Artist Trading Cards because I have joined a new community called IllustratedATCs and it is all about trading art by mail. They do lots of stuff besides the ATCs, like moleskin journal swaps and inchies and twinchies and holy cow, tons of stuff. They have provided a helpful list of definitions (thank goodness). I think I saw their link initially through someone at Illustration Friday, but I don’t remember! You have to apply and whoa, there are some seriously cool (and many professional) artists there. I got accepted (it takes 3-4 days), but then I was instantly intimidated. Super nice folks so far, though. They have another site called ATCs for All where there is no application and everyone is welcome to join. I am pretty happy with all three, though the horse in particular is sort of caught between cartoonish and realistic as if I could not choose which way to go. I really like the blue sky on that one, achieved with the help of a Masquepen. 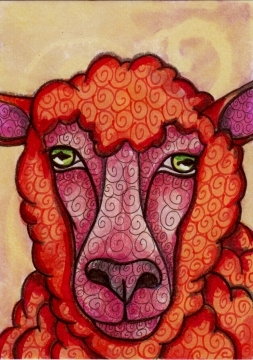 Both the llama and sheep were done on top of light-colored swirly backgrounds also done using a Masquepen. I worked on all of them over the course of a few hours, doing some reading and IF visiting in between. 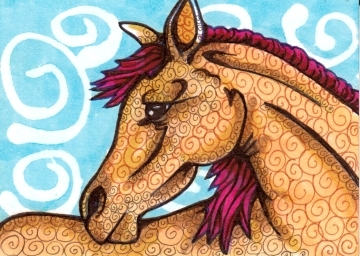 This entry was posted in ATCs and ACEOs, Copic Markers, Progression Photos, sketches and tagged beasts, Copic Markers, horse, illustration, liquid frisket, llama, pen and ink on July 10, 2012 by The Beast Tender. Hi! Just yesterday I was just looking at the Steampunk Llama I purchased from you and thinking how happy I was to own it. I love seeing your take on all the different critters that wander into your imagination. These are a good-looking trio as well. I’m particularly fond of the Llama, but the horse really caught my eye with his arched neck, strong jaw, and soulful look – not to mention the magenta mane! Oh! I was also looking at the “Beasts” you gave me. Still love those guys!!! Congrats on being chosen. I always love your steampunks and llamas especially this new green one. These are all excellent! Happy trading!! If I were trading, I want all three of these! They’re all expressive and beautifully designed and rendered. Enjoy the trade! These are all wonderful, Cindy! My favorite is that adorable sheep! I wish I still had time for exchanges and such. I’ve done a lot of them and they were really fun! I have art from all over the world, too, thanks to these swaps. Way cool! Adorable…..your swirls are back! Congrats for being chosen….I’ll have to check them out. 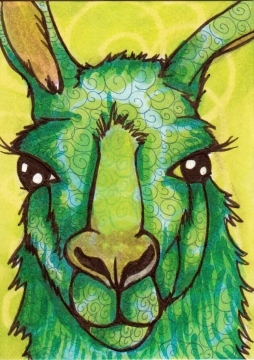 I love the llama, my personal favorite from when I first found you on Etsy. These are just lovely. I like the swirl pattern you put into each one. The llama is my favourite! Oh my gosh! AWESOME my fav is the Llama! have wanted to do one for a while! All so great! well done u! Congrats on acceptance to the group! woo hoo! yay! pretty cool!